In April 2015 the German Army announced it's plans to increase the operational Leopard 2 fleet by 103 tanks. Since then not a lot has happened, as revealed in official documents and in newspaper articles from the Februrary of 2017. At least some of the tanks are currently owned by the German defence industry, so the government has to buy them back - but no contract has been signed within nearly two years of planning. The Leopard 2A4 main battle tank (MBT) is an improved version from the mid/late 1980s of the original Leopard 2 tank. By modern standards it has outdated armor, a short gun with inferior armor penetration and range, while lacking of modern electronics, optronics and relying on the more dangerous hydraulic systems instead of using electric drives. Original reports from last year expected 84 of the new tanks to be upgraded to the Leopard 2A7 or the improved Leopard 2A7V configuration. The costs for buying and upgrading the tanks are expected to be about 760 million Euros, the contract might be signed before summer of 2017; if not the whole program might be delayed by another year due to the German elections in September 2017. The reason for the current delays is a disagreement between the two companies Krauss-Maffei Wegmann (KMW) and Rheinmetall. Current workshare plans see about a third of the work (and the money) going to Rheinmetall, but the company demands more. Rheinmetall acquired the military division of Maschiennebau Kiel (MaK) in 1990, which was responsible for manufacturing 45% of all German Leopard 2 tanks. Rheinmetall is also a major subcontractor for the main armament, delivering the L/55 smoothbore gun for the tank. KMW on the other hand doesn't want to share any more work and money with the much larger competitor, which has decided to invade KMW's core business by offering Leopard 2 upgrade since 2010. The company has a much more specialized portfolio than Rheinmetall, pretty much offering combat vehicles and remote weapon stations (RWS) only. Meanwhile the upgrade of fifty Leopard 2A6M to the so-called Leopard 2A6M+ configuration is under way. This is an inofficial name only, which is supposedly used to differentiate between upgraded and stock Leopard 2A6M tanks. After the upgrade the 2A6M+ designation will be dropped and all vehicles will be refered to as Leopard 2A6M. The commander's sight will be replaced by the new PERI R17A3 incorporating a third generation ATTICA thermal imager, which was first adopted on the Leopard 2A7 in 2014. The SOTAS-IP multi-media communication system from the French company Thales is installed in the Leopard 2A6M+. Aside of the Leopard 2A7 tank, it is also used on the Boxer armored personnel carrier (APC) and the Puma infantry fighting vehicle (IFV); it is also part of the IDZ soldier system. To deal with the increased power demands, the tank is fitted ultra capactiors, which can deliver energy faster and increase the stability of the electrical power supply. The Deugra fire supression system has been reactivated using the extinguishing agent DeuGen-N FE36 (for a certain period of time the fire supression system was not utilized due to the previous extinguishing agent violating environment laws). The upgrade also features new digital control panels for the crew. At the IDEX 2017 military exhibition two variants of the Leopard 2 were present: Rheinmetall demonstrated a prototype or testbed of the, currently in development, Leopard 2PL tank, while KMW presented the Leopard 2A7Q, which has been refered to as Leopard 2A7+ or Leopard 2A7 QAT by numerous other sources. Rheinmetall is also delivering the Leopard 2RI to Indenonesia, which features greatly enhanced armor protection, air conditioning and other features. The Leopard 2PL is an upgraded Leopard 2A4 tank meant for the Polish Army. It is based on the modular MBT Revolution upgrade, which has been renamed to Advanced Technology Demonstator (ADT). 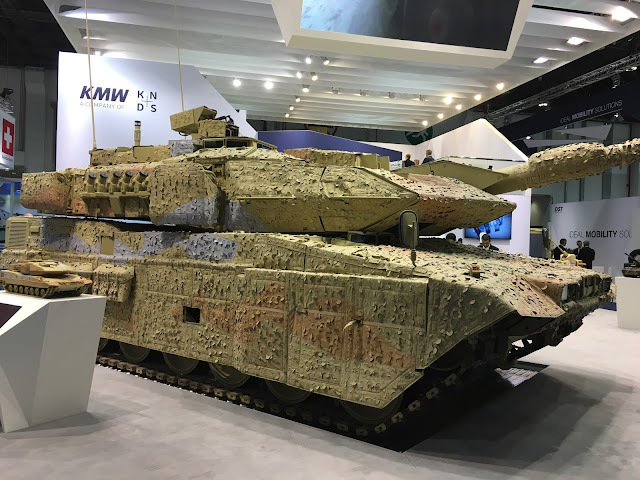 The tank features improved armor protection by adding thick AMAP composite armor modules to the turret, supposedly increasing protection level beyond the Leopard 2A5 level. 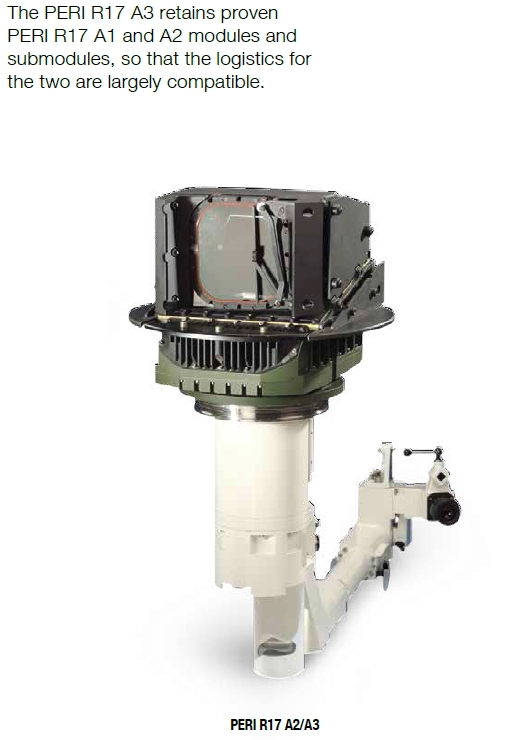 New optics with a Polish-made third generation thermal imager and Jenoptik's electric turret drives are also part of the upgrade. Changes to the fire control system (FCS) allow the usage of the programmable 120 mm DM11 high explosive (HE) ammunition and the DM63A1 APFSDS round with temperature independent propellant and high penetration capabilties. A new addition of the vehicle presented at IDEX 2017 is the MSSA (main sensor slaved armament) remote weapon station, which does not have it's own optics and is coupled to the commander's independent sight. It is not part of the upgrade of the Polish Leopard 2A4 tanks. The installation of the MSSA also means that the digital SEOSS sight is utilized instead of the PERI R17A3. Rheinmetall is in the process of bidding for an upgrade contract of the Turkish Leopard 2A4 tanks, which suffered heavy losses in Syria - or at least ISIS wants us to believe that. The company is also part of a joint venture that is trying to get the contract for producing the new Turkish Altay MBT. 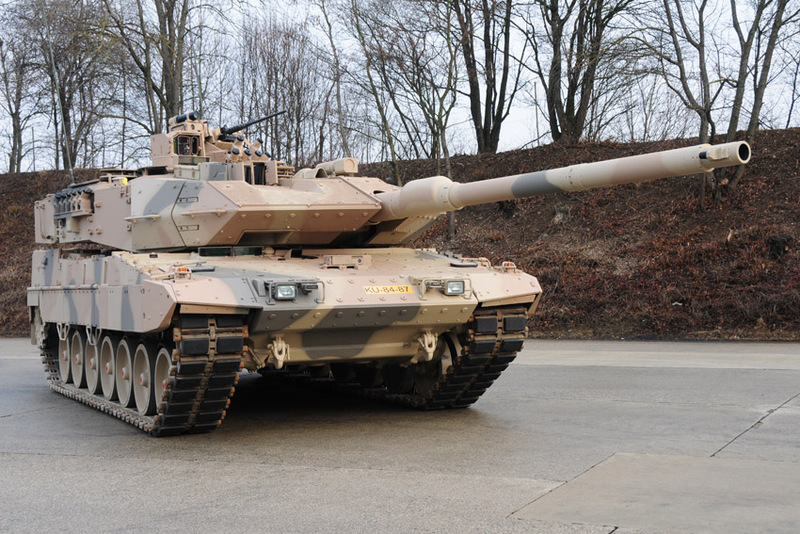 The Leopard 2A7Q is a version of the MBT made for the Qatari Army. It is based on the Leopard 2A7+ demonstrator from KMW, thus it includes a number of changes currently not found on the German Leopard 2A7, such as the additional hull armor kit, the passive bomblet and top-attack protection on the roof and the FLW 200 RWS. The Leopard 2A7Q is fitted with a modified APU, which is even running when the vehicle is standing still in order to power the air conditioning system. The Barracuda camouflage system of the Leopard 2A7Q is having longer skirts, which reduces dust clouds when driving through the desert. According to unconfirmed rumors an unknown nation has purchased (or ordered) a large number of Leopard 2 tanks from KMW. An indicator for the validity - or maybe the origin - of this rumor is a sheet of paper being attached to the Leopard 2A7Q at IDEX 2017, which contained the text "SOLD". After the purchase and upgrade of the Leopard 2A4 tanks, the German Army will have 103 Leopard 2A7(V) tanks in service. 48 Leopard 2A6M(+) and 152 Leopard 2A6 will supplement them. Seventeen Leopard 2A5 will remain at the combat training centre, being the last vehicles fitted with the short-barreled L/44 gun. Thirty-two Leopard 2 tanks (including 20 of the re-purchased Leopard 2A4) tanks will be kept for conversion to combat engineering vehicles, bridge-layers and other variants. Two Leopard 2A5, two Leopard 2A6, two Leopard 2A6M and one Leopard 2A7(V) tank will remain at the German military procurement office, the BAAinBw as reference and for tests, trials aswell as upgrade proposals. On the long run all tanks should be converted to a single version in order to keep logistics at a reasonable level. For the Leopard 2A7V many technologies and features have been considered, but the only known demonstrator from KMW is a rather conventional upgrade. All Leopard 2A7 tanks are meant to be upgraded to the 2A7V configuration until 2022. What exactly will be changed is unknown, but apparently the engine will remain the dated MB 873 Ka-501 from MTU. It's very reliable and fuel efficient, but bulky by modern standards. Instead of replacing the engine, the powerpack and drivetrain will be modified - in particular the transmission and the side drives - to improve the mobility of the tank. If this allows to reach the original requirement for the Leopard 2A7V - regaining the mobility of the 10 tons lighter original version of the Leopard 2 - is questionable at least. The drivetrain also will be strengthened to deal with the high weight, while the APU's power output has been raised to 20 kilowatts. The Leopard 2A7V will feature enhanced armor protection, which might be limited to the installation of a hull armor kit. However the basic Leopard 2A7 is already fitted with connectors, which allow fitting additional armor packages to the sides of the hull and turret when required. The composite armor modules at the upper front plate (the glaics) are about 45 mm thick; including the slope this boosts armor thickness from aproximately 328 milimetres to 697 milimetres. The relatively thin glacis relies on it's extreme slope; against highly sloped armor most shaped charge warheads fail to fuze, while APFSDS penetrators have a tendency to break, which greatly reduces the penetration performance. At the hull nose and lower front plate, the increase in armor thickness is estimated to be about 200 to 300 milimetres. This is a considerable improvment compared to the original Leopard 2 hull. While thickness and shape are similar to the MEXAS-H hull armor of the Strv 122, Leopard 2A5DK, Leopard 2A6HEL, and Leopardo 2E, the size and locations of the mounting bolts has been altered. This might imply a change in armor composition, a more modern version (using newer AMAP technology) would offer better resistance to penetration or lower weight for a given protection level. The Leopard 2A7V upgrade is said to include improved main optics for the gunner - the old first generation WBG-X thermal imager would be replaced by a third generation ATTICA device. The SPECTUS sight from Airbus (originally developed by Zeiss, but the military divison was sold to Airbus) provides the driver with IR night-vision aswell as a thermal image. A new camera system for better situational awareness was fitted to the KMW demonstator vehicle at Eurosatory 2016. 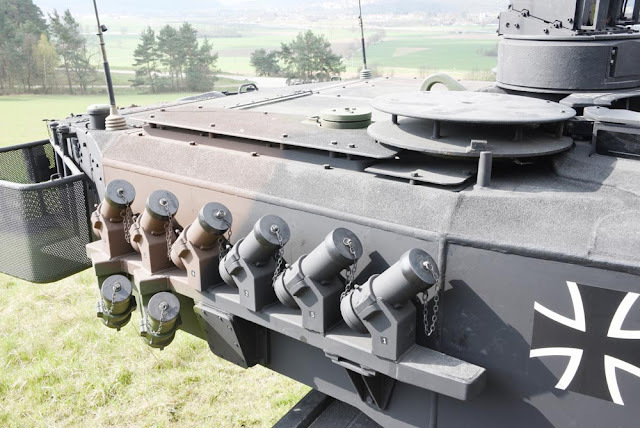 The FLW-200 remote weapon station is also expected to be part of the Leopard 2A7V upgrade. It can be fitted with (heavy) machine guns and automatic grenade launchers. Denmark supposedly will upgrade at least some of it's tank to a similar configuration. Last year the company Rheinmetall announced, that the new L/55A1 gun will be delivered to the first costumer in 2017. According to the company, the launch costumer will be the German Army, implying this gun will be part of the Leopard 2A7V upgrade. The L/55A1 smoothbore gun is an enhanced Rh 120 L/55, which can handle higher pressures: This will result in an increase in performance (penetration and range) by 20% according to earlier data from the manufacturer. On the long run the Leopard 2 and the French Leclerc MBT will be replaced by the Main Ground Combat System (MGCS), a next-generation tank for which Rheinmetall developed a 130 mm smoothbore gun with 50% improved penetration capabilties. The MGCS is a co-development between Germany and France, but other countries are expected to join the development. Rumors - or speculation from random forum users - suggests that the turret might be developed in France, while the hull would be made in Germany. 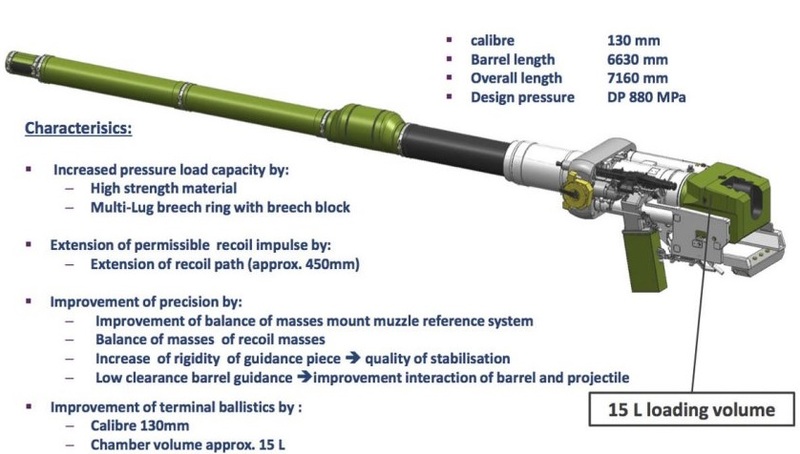 These speculations seems to be rather questionable, although the French know-how in autoloader-design might be an important aspect for the MGCS. The conception phase for the Main Ground Combat System is expected to end in 2017, after that the development of first prototypes would start. In the timeframe from 2025 to 2030 the first vehicles should be ready. Great article and great to have you back writing. Do you think the protection improvement might be a new system that has not been seen or a modification of the existing systems? Another informative blog… Thank you for sharing it.Thank you very much.